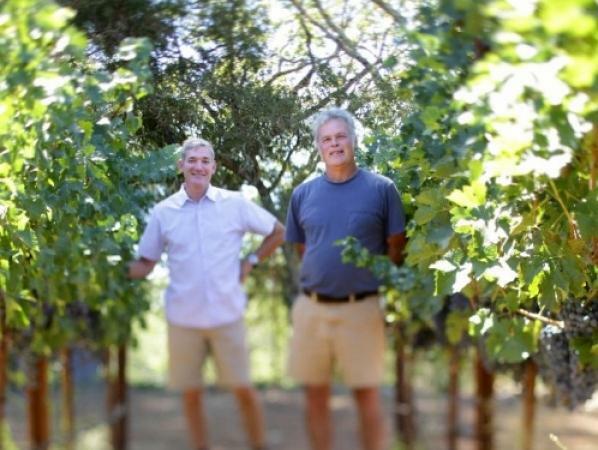 "On a spring evening in 2001, Winemaker Robbie Meyer, Alan Peirson and Lesley Warner Peirson were musing about the future over a bottle of wine. In classic fashion we came up with the name and logo for our brand, sketching it out on a cocktail napkin. That evening began our adventure together; in the Fall of 2001 we produced our first vintage, 300 cases of Russian River Valley Chardonnay. Today, PEIRSON MEYER produces 3,000 cases with ten wines from Napa Valley, Russian River Valley and the Sonoma Coast. The Peirson Meyer label is named after the two founding families. The artwork for our logo is taken from an original "Untitled" etching by friend and Bay Area artist, Yasuhiro Esaki. The piece is from a series of works Esaki created while researching human DNA. We call it "the knot." The farming practices for all of the wines we produce are tailored to each vineyard site with the goal of producing the best wine grapes possible from a given season. Regardless of the challenges Mother Nature can bring within a season, it is these judicious vineyard practices year in and year out that allows us to produce exceptional hand crafted wines capturing the best expression of the vineyard site."